Green Bay & Northeast Wisconsin's Premier Excavating and Demolition Contractor. 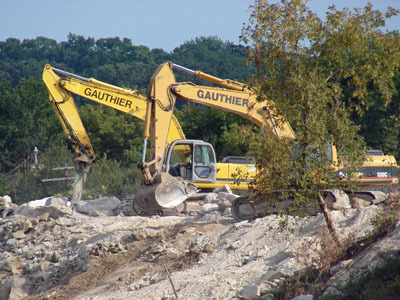 The Gauthier family has been providing earthwork and demolition services for general contractors, municipalities and businesses since 1930. Throughout these 80 years, Gauthier's strength and reputation remains in providing the highest quality of work and service to their clients. A tremendous amount of pride is taken knowing projects have met or exceeded project goals and deadlines. Earthmoving with Excellence in Construction Safety. Gauthier employees and management stay updated through ongoing participation in education and safety training opportunities. This training often involves contracting consultants for in-house seminars. Tom Gauthier has always put the safety of employees, on-site personnel and the environment first. Annual recipients of AGC Safety Excellence Award.